sit-stay-play In-home pet sitting & more.LLC is devoted to helping pet parents be the best they can. In doing so, we have a wide-variety of services to help meet the demands our clients desire. Our services are available in Muncie, Anderson, Yorktown, Daleville, Chesterfield, Hartford City, Albany, New Castle, Pendleton, Lapel, Fishers, Noblesville, Carmel and Indianapolis, Indiana. Don’t see your town listed? If you’re close to one listed here, chances are we can provide care in your area. Please contact us if you’d like to schedule a service or if you have any questions. Pet Sitting – Services can be scheduled for short-term occasions or for longer situations. We come to your home and provide reliable, compassionate and affordable pet care. Your pet is fed, watered, given exercise and TLC. this is a great alternative to boarding and works well for aging pets, multiple pets and pets with behavior/medical issues. We notify you via text, email or by telephone if you want to know how your pet is doing. Generally, prices start at $20/visit. Visit our website for all the details! Dog Walking – Walks can be done in your neighborhood or for a small additional fee, we can take your dog to the dog park, Cardinal Greenway or other area. Single walks start at $18, discounts for weekly and monthly visits. Click here to learn about our dog walking services. Poop Scooping – Don’t have time to clean up your yard? We can help. Prices start at $25 per yard. You can schedule weekly, bi-weekly or monthly cleanings. Farm Sitting – Cows, horses, chickens and other farm animals need care too! We’ll visit your property, assess the needs and estimate time commitment involved and will feed, water, rotate, collect eggs, put animals in/remove from paddock, muck stalls, administer medication and just about any other pet/farm animal need you require. Each job is different therefore a quote is given at time of consultation. Click here to learn about our farm sitting services..
Pet Taxi – We can take your pet to the veterinarian, groomer or other predetermined location. Your vehicle will remain “hair-free” and you can do something else while your pet is being cared for by pet sitting professionals. This is a great service for individuals without transportation, for people unable to handle their pet in a vehicle alone and for people who can’t drive. One way trips in Muncie start at $25 with a discount to pets going/coming from Happy Dogs out on W. Jackson St. To schedule services, go to our pet taxi service page. Basic Obedience Training – Our private, individual obedience classes are done in your home. We teach the basic commands such as: sit, down, come, stay, wait, easy, loose leash walking and proper socialization. Prices start at $20. Click this link to learn more about training. ‘Helping Hands’ for Senior Pet Owners – These services are great for people who just need a little extra help in caring for their pet. We come to the home, retirement community or assisted living facility and provide help with changing cat litter, potty training, grooming, dog/puppy training, nail trims and other services by request. Price quote is given at time of consultation. Click this link to learn more. These are just SOME of our most popular services. Feel free to browse around on our website to see a complete list of what we do. 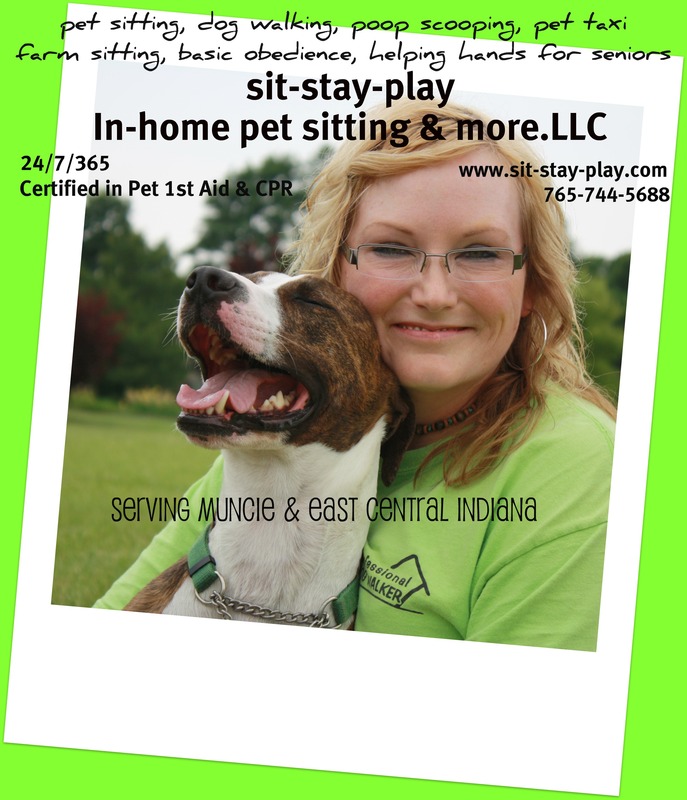 sit-stay-play In-home pet sitting & more.LLC provides care to all of east central Indiana. We’re professional, insured and available 24 hours a day, 7 days a week. Please contact Kelley at 765-744-5688 to discuss services or send an email to kelley@sit-stay-play.com.